Submitting an application online allows our volunteers to review your application and begin a dialog with you about the pet(s) that interest you. It also saves you time at the adoption event, allowing you to make the most of your adoption day visit. Please review our Adoption Process before submitting an application. Browse our dog listings to find one or more dogs that interest you. 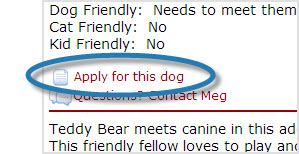 On the details page of the dog you are most interested in, click the Apply link. This will take you to the appropriate Adoption application. 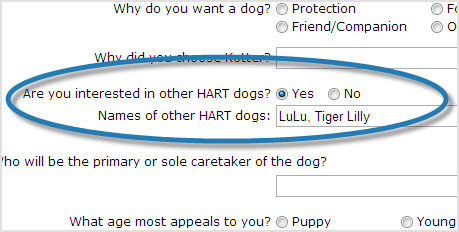 If you are interested in multiple dogs, in Part 3 of the application, select Yes, and then enter the names of the other dogs that interest you. If the dog's name includes a number, be sure to include it to avoid confusion! Complete the rest of the application, and then click Submit. After your application has been successully submitted, click the Print button to print a copy of your completed application. You will also receive a copy of your application via email. Be sure to bring your printed application with you to the adoption event! Worried you might change your mind at the adoption event? No problem! Just let the volunteers at the table know you changed your mind. Browse our cat listings to find one or more cats that interest you. Can't find a cat you love? Submit a generic cat application and we'll help you find one. 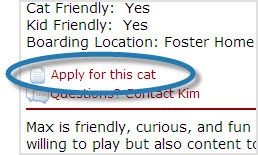 On the details page of the cat you are most interested in, click the Apply link. If you are interested in multiple cats, enter the names of the other cats that interest you. If the cat's name includes a number, be sure to include it to avoid confusion! After your application has been successully submitted, you will receive a copy of your application via email. Be sure to print a copy of your application to bring with you to the adoption event!